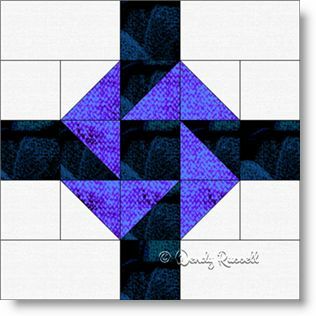 The Blue Yukon quilt block is a simple five patch design featuring only squares, rectangles and half square triangles. The design is constructed as an uneven nine patch to make the construction easier (at least in my opinion), rather than sewing row by row. The two sample quilts illustrated use standard quilt block settings for their designs. The on point quilt layout uses extra blank blocks for an additional spark of colour.